I just saw the movie event of the summer. And I waited until I saw it twice to be sure. 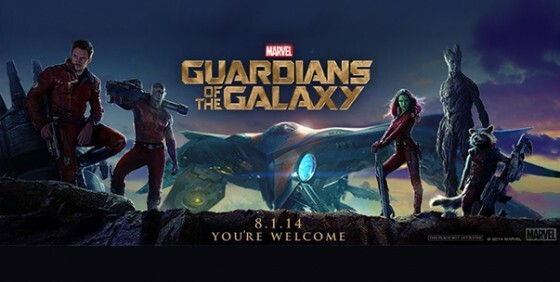 Guardians of the Galaxy is one of the best, deepest and most fully integrated films of the Marvel Cinematic Universe. Never has a film been so loaded with references to other parts of the universe, without sacrificing the integrity of the story. This story is one of the deepest multi-character arcs since Silverado. What took the Avengers 6 movies to create, has been surpassed by 5 character arcs that most of its non-fan-boy viewers had never heard of 2 years ago. By the time the Nova Corps Officer Garthan Saal says “What a bunch of A-holes,” to the line up of 4 of our 5 characters, we are already invested in learning more about what makes them tick. Even so, one can’t help but appreciate that it had been only been 4 of the team we had met by then. If they really didn’t care about telling a story, you would have met all 5 by then. James Gunn, however, knows what it’s like to tell a story that breathes. It’s not easy to place a pile of characters into an 2 hour story and make you care about some of them, much less all of them. Young Peter Quill is placed firmly in our hearts almost instantly. We meet him outside of his mother’s hospital room listening to 10cc’s “I’m Not In Love” from the tape his mother gave him, Super Awesome Mix, Vol. 1. The song’s sadness permeates our senses in a way never imagined for a song that is essentially a synopsis to relationships of the Me-Decade 1970’s. If that’s not enough, he is taken away via spaceship almost immediately after. That has something to do with the mystery of his father. That’s just the beginning though. Even my 7-year-old knew that the story was going to move forward several years later and she was thrilled to share that with me. When we pick Quill (Pratt) up again, he’s having an Indiana Jones moment. He calls himself Star Lord, too. Instead of tension, though, we get another mood set through music. This time through Redbone’s “Come and Get Your Love” he grooves his way to a site where he picks up this story’s MacGuffin, the orb, one of the infinity stones that Marvel is using to set up The Avengers III. This orb is wanted by many people, and soon we have Gamora (Saldona) pursuing him at the behest of Ronan the Accuser (Pace) while Rocket (Cooper) and Groot (Diesel) are after a bounty on him placed by Yondu (Rooker). Their combined scrap on the Nova Corps home world lands them all in the clink. It is there that we meet Drax the Destroyer. He invites himself into the fracas and eventually they all team up. My 7-year-old knew that would happen, too. Watching the team develop is fun, particularly because of the personalities involved. We get real world examples, followed by quips of exposition. It’s a routine we’ve seen before, but seldom so casually effective. There is an economy of imagery and screenplay, but we get enough of this to make sense of the story and still be amused when we discover more. Rocket and Groot are an incredible duo. Not unlike Han and Chewbacca, we have a hot head and his dedicated huge partner with the low word count. If that is all there is, it’d be a disappointment. Groot has a vulnerability that is incredibly endearing. He is routinely cut down, with a quizzical look on his face. He is always looking to Rocket for guidance, but it does not stop him from expressing a different opinion when appropriate. He has hands down the majority of the top scenes in the film. I will not give any away, but he has the most beautifully expressive brown eyes. Rocket, he’s supposed to be a trigger happy mouth and he delivers. He is brash but never foolish as he makes others out to be. Rocket’s ideas always work, especially when it involves building stuff to get out of predicaments. We get a glimpse of what happened to create him (think Wolverine) and it makes us curious for more. Gamora’s past is not a mystery. We know that she and her sister Nebula (Gillian) are really subjects of grand nemesis Thanos. He calls them children, but like all of his children, they just come from places and groups of people he made dead. Neither of them are all that invested in Thanos’ or Ronan’s plans but we’ll see more of that later. Drax’s story intersects with that of Gamora, and this is good for business. His rage helps form the group and is focused on Ronan and the orb and Ronan is focused on getting that orb. Eventually these forces have to meet. And meet they do, in a big way. The great thing about Drax is that his one dimension is stretching into another one. Maybe two. The last 3rd of the movie has two major settings: outside planet Zandar and another on the planet’s surface. The battle outside the planet is huge with lots of explosions. There are plenty enough scenes for everyone it’s tempting to think it’s going to be over after the biggest boom. Of course it’s not. We need to see Peter Quill’s big moment and we need to see Star Lord’s big moment. Beautifully, we are lead in with music. This time “O-o-o-h Child” leading to a delightfully bad Peter Quill dance off. Then Star Lord has his second huge moment. No telling about the first. I saw this movie with two girls aged 7 and 11. Neither were all that interested. They both stayed at attention the whole movie, and laughed throughout. See this movie if you like seeing characters who are growing in front of your eyes. See it if you like worthwhile special effects that give to but do not overwhelm the story. See this if you want to experience a story firmly its own but also bursting at the seams with references that could pay dividends later. Or not. See Guardians of the Galaxy if you want to have as much fun as you’ve had in a long time.